While visiting the Grand Canyon, discover an abundance of wildlife at the Bearizona Wildlife Park. This self-drive-through park features three miles of untamed Arizona wilderness, with black bears, sheep, bisons, wolves, deer, elk, goats and more. 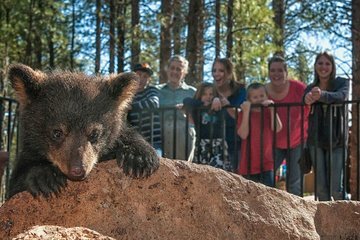 Also, Fort Bearizona is a walking exhibit that’s home to baby animals — like bear cubs and wolf pups — plus smaller species of wildlife, a petting zoo and more. In the Birds of Prey show, get face to face with and learn more about hawks, owls, falcons and other raptors. Fun for the entire family. 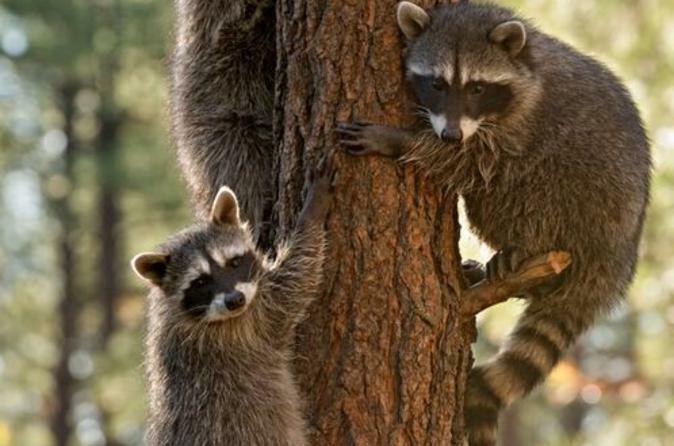 Amidst the Ponderosa pine forests of northern Arizona — and just 60 miles from the Grand Canyon — is the Bearizona Wildlife Park, a natural animal sanctuary with a large variety of North American wildlife. The bulk of the park is a 3-mile, self-driving tour. This adventure features the likes of Rocky Mountain goats and elk, Alaskan Dall sheep and tundra wolves, arctic wolves, mule deer, American burros, black bears, bighorn sheep, white and brown bisons and more. Then, stroll through winding walkways to get an up-close look at the playful antics of even more animals on exhibit, like beavers, porcupines, otters, bear cubs, bobcats, javelinas, foxes and more. There’s also the Bearizona Barnyard petting zoo, to get up close with the baby animals, and a Mine Shaft Experience, which houses some nocturnal animals and even a few creepy crawly critters. Finally, enjoy a Birds of Prey exhibition, which allows visitors to come face to face with hawks, owls, falcons and other raptors. Programs include training demos and free-flight shows, all with a narrative on natural history, conservation and interesting facts — an entertaining and educational experience for all ages. Bearizona is a great place, you get to see the animals roam freely as you drive your car through then you get to walk and see all the smaller animals in the park area. Being able to get so close to all the wildlife in a wide open area was phenomenal!!! Then to be able to walk around and see other wildlife was so much fun. There was a white peacock that hung out near snack bar, until toddlers went chasing after it. The animals were out today and it was a beautiful day. If you go, be sure to take the Wild Bus Ride. The driver/tour guide gives a lot of insight that you can't get by doing the drive around. Our daughter, son-in-law, and granddaughter thoroughly enjoyed the day at Bearizona! Very fun we drove through the park and really enjoyed seeing the animals. Then we rode the bus and got to see them up closer and told some history of them and their names. Watched the show about owls. and walked around the area where you can walkt the kids especially liked the petting zoo part. We really enjoyed this park, they were doing some upgrades so the gift store and some animals were not available but it was still great. It looks like all the animals are well taken care of and everything was so clean. The drive through was great even in winter, the bears came right by our car. And the buffalo, goats etc was close enough to see with no problem. The walk through was great too, they had 2 baby cubs that were right by the fence playing. You can really tell that the people working there really loved their jobs. It was so great that I can't wait to go back next time we are near there. We highly recommend Bearizona to everyone! Kids or no kids! You can drive thru 3 times, which on the 2nd time the wolves and bears were awake and active. It was starting to rain, just sprinkling lightly, and that seem to bring the animals out and unto the road in front of us. Though you're not allowed to roll your windows down for obvious reasons!, you are still able to take some good photos. The kids loved the petting zoo area, but because of the rain, there weren't very many out. The wilderness feeling while driving thru is beautiful! Extremely friendly staff, too!!!! We saw Bears and wolves up very close! They were very well cared for and calm. It was absolutely incredible!